Some prominent U.S. restaurant and fast food chains are offering Tax Day 2018 freebies and discounts to consumers looking to celebrate the end of filing season. Americans have until Tuesday to file their federal tax forms or request an extension until Oct. 15. Some consumers are looking forward to a substantial tax rebate check, while others are bracing for a much lower checking account balance. FOX Business breaks down the best food deals at U.S. chains below. Customers don’t have to show up on Tax Day to get Applebee’s “Dollarita.” The $1 margarita is available throughout the entire month of April. The fast-casual restaurant chain is offering a $10.40 “Tax Day Special,” inspired by 1040 tax form. For that price, customers get a half chicken, two sides, cornbread and a drink. Participating Chili’s locations are selling $5 Cuervo Blue margaritas. The kid-friendly pizza chain is offering a buy one, get one free deal for large pizzas from Tuesday to Thursday this week. 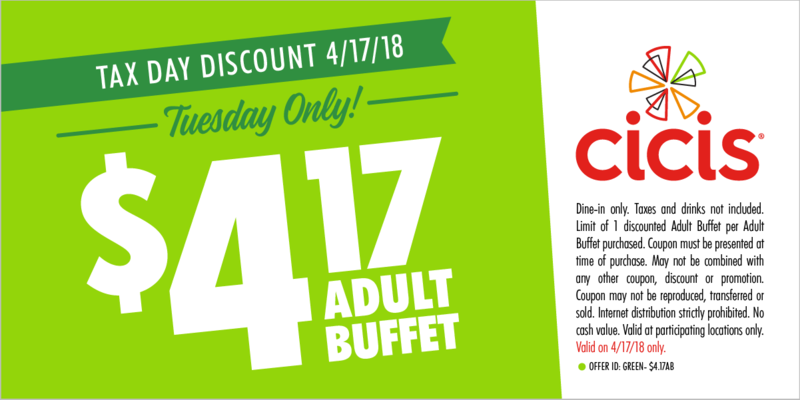 With the right coupon, Cici’s customers will pay just $4.17 for the adult buffet at participating locations. 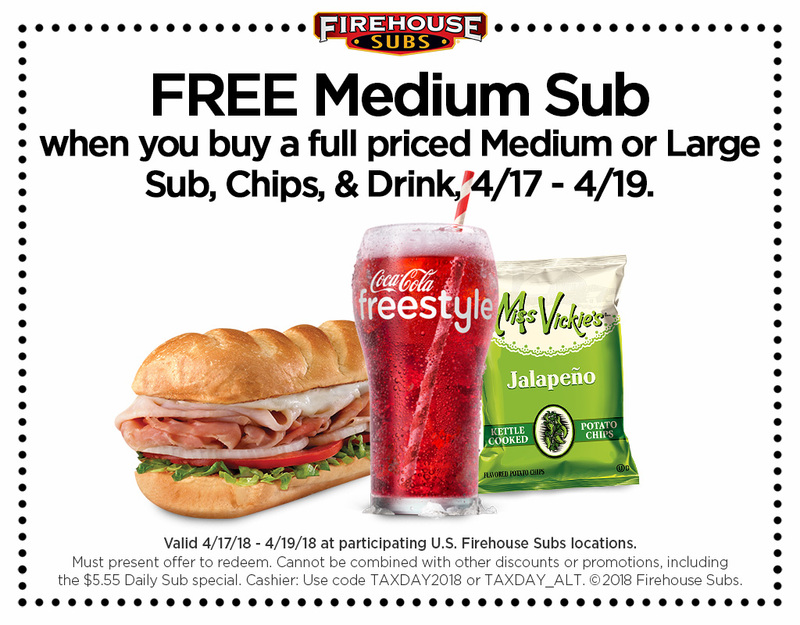 Customers with a Tax Day coupon can get a free medium Firehouse sub with the purchase of a medium or large sandwich combo meal. Customers who use the code phrase “made from scratch” at Hardee’s locations receive a free sausage biscuit from 7 a.m. to 10 a.m. Kids ages 12 or younger can receive a free kids meal with a purchase of $10 or more by an accompanying adult. The offer is good from Saturday April 14 through Tuesday. The fast-food chain is offering various promotions that differ based on store location, including discounted Big Macs and chicken nuggets at some Florida restaurants, according to the Sun Sentinel. Check with your local restaurant to see if any Tax Day deals are available. With promo code “TAXDAY,” P.F. Chang’s customers can get 15% off online orders on Monday and Tuesday. The sandwich shop is offering a festive 10.40% discount on all purchases for new and current members of its “Toasty Points” loyalty program. Creators of the "Original" sandwich will give customers who buy chips and a medium drink a small version of their trademark sandwich. The drive-in chain known for its adventurous menu options is selling cheeseburgers at half price all day on Tax Day.